If you don't have secure parking at your workplace, or will be locking your bicycle in unsecured areas, you should have a serious lock, such as a Kryptonite. You need not carry it home every night unless you also are locking the bicycle in high-crime areas on the way home. The weight of a typical U-lock represents the difference between a $400 bike and a $1000 bike. People tend to buy big, clunky U-locks because they don't know how to use them properly. A U-lock can go around the rear rim and tire, somewhere inside the rear triangle of the frame without looping it around the seat tube: the wheel cannot be pulled through the rear triangle. 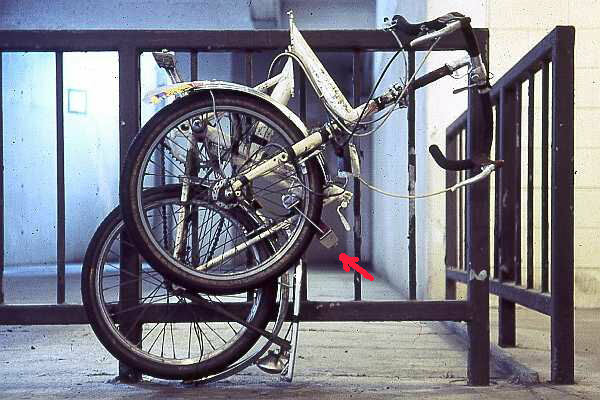 A lock which passes around a rim makes the bicycle unrideable even if the object it is locked to can be broken or disassembled. The best U-locks, if you must carry one on the bike, are the smallest. The Kryptonite Mini is much smaller and lighter than the more popular models, but just as secure. It may be even more secure, because of the limited room to put an automotive jack inside it. It also gives less purchase for leverage-based attacks. Some will object that felons might cut the rear rim and tire to remove a lock. This just doesn't happen in the real world. It is possible to cut the rim with a hacksaw, working from the outside to the inside, but first, the tire must be removed or cut through. It would be a lot of work to steal a frame without a usable rear wheel, the most expensive part of a bike after the frame. On the other hand, a slightly longer lock would fit around the rim, and the chainstays or seatstays...or locking from the left side might allow a smaller lock because the chain doesn't get in the way...you might need a longer lock too, for when you can't get the bike as close to a pole. Some workplaces have secure bicycle parking. You may be able to take the bicycle inside your workplace, or there may be a secured parking area. 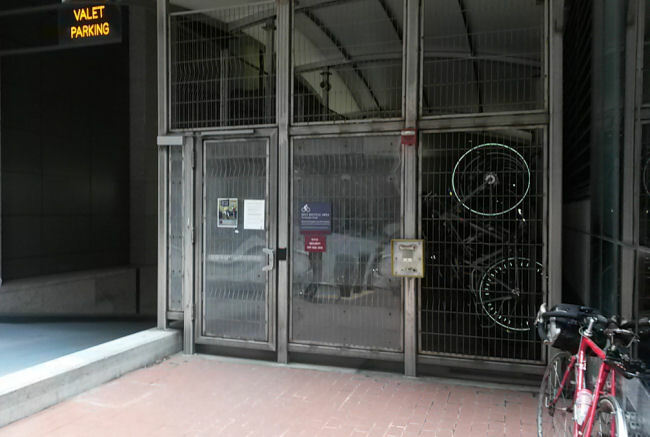 The bike cage shown in the photos below is next to the parking-garage entrance at the Dana Farber Cancer Institute in Boston. The entrance is under video surveillance and the door has an electrically-operated lock. Employees enter by swiping a smart card; others must press a button to speak over an intercom with a guard who releases the door. Still, lock the bicycle and remove valuable items. Lacking this level of security, you can leave a heavy lock at work, locked to whatever you normally lock your bike to. Carry a light cable lock with you for quick errands or emergencies. It is easily cut, but you are making a trade-off between security and convenience. If you must lock your bike in an unsecured area, choose an area exposed to public view if possible. You may be able to lock your bike in a praking garage in view of the attendant. If you use both the U-lock and the cable lock, you are more than twice as safe as you would be with either of them alone. Either type of lock can be defeated, but each requires a different large, bulky tool which is useless against the other. The cable lock will secure your front wheel to the frame and any convenient object, and the U-lock will secure the rear wheel and frame. If you have a quick-release seatpost bolt, replace it with an Allen-head bolt, put a cheap saddle on your commute bike, and then you won't worry. The best cable locks have the lock built-in, rather than relying on a padlock. The padlock is the weak link, easily cut with bolt cutters, the tool of choice for most bike thieves. A new, sharp bolt cutter will cut a cable too, but an old, worn-out one will only crush a cable. Lock to an object which would be difficult to cut or disassemble, and where the bicycle can't be lifted over the top. Good, secure bicycle racks are becoming common these days: "dishdrainer", wheel-bending racks are seen less often. A thick signpost, cast-iron fencepost, parking meter post etc. is good, as long as locking there is legal: bicycles also may be removed by police and maintenance crews. 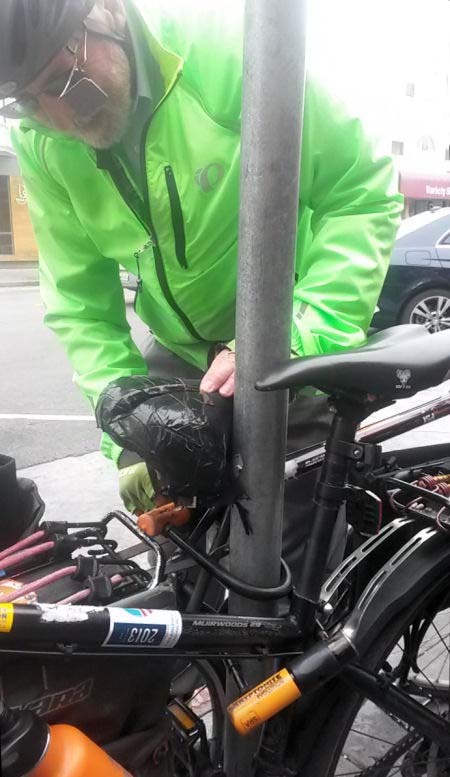 Check before locking: some posts can be lifted out of the ground, and thieves have been known to cut bicycle racks, taping over the cuts to hide them. If you are stuck with a dishdrainer rack, lock to the end of it if you can. If one is in a secure area, back the bicycle in:: the rear wheel, unlike the front, will hold the bicycle steady. Lock the rear wheel to the rack and the frame to the wheel for additional security. Face the keyhole of your lock down, so water doesn't run into it. Some locks have sliding covers for the combination dials or keyhole. Let's take some advice from John's friend Bert Hill. Bert is shown here locking his bicycle on the street in San Francisco. A bicycle he lent me (John) is on the closer side of the signpost. We were about to go into a restaurant for lunch. Ride a bicycle which is less attractive to thieves than others locked nearby -- same as Sheldon's advice. The old saddle on Bert's bike, its torn cover wrapped in gaffer's tape, is no less comfortable than it was when new. The bicycle Bert lent to me, on the near side of the post, is less ugly, but still not a prime target for thieves. Wrap the U of lock around the post so the crossbar is on the bicycle side. This way, if someone locks a bicycle to the other side of the post, you will still be able to get the key into your lock. 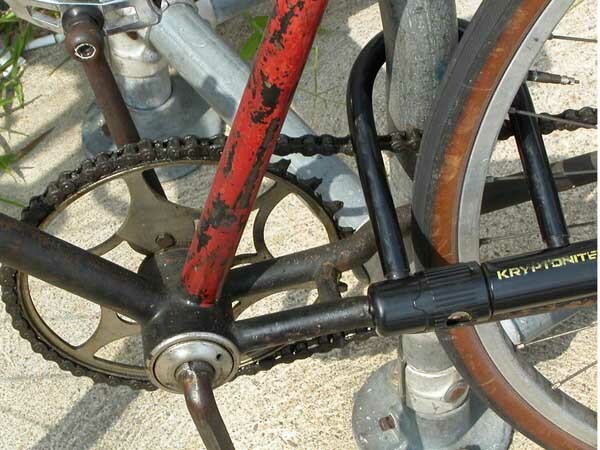 Lock the right side of the bicycle toward the signpost or rack, making removal of drivetrain components more difficult. (Works best with two bicycles locked head-to-tail, as shown). Hmm -- Bert has not locked the wheels. Why not? And Bert's bicycles have quick-release wheels. An explanation follows. Quick releases are great for quick wheel changes during races, and for when a bicycle is boxed or bagged or transported in a car, but are also great for thieves. Stories abound of wheel thefts, and of thefts where one naive person locked the back wheel, another the front wheel, a thief assembled parts from the two bicycles and rode away. Bert uses quick-release replacements. These defeat the purpose of the quick releases for the user -- but also for thieves. Common brands are Pinhead Locks and Pitlock. 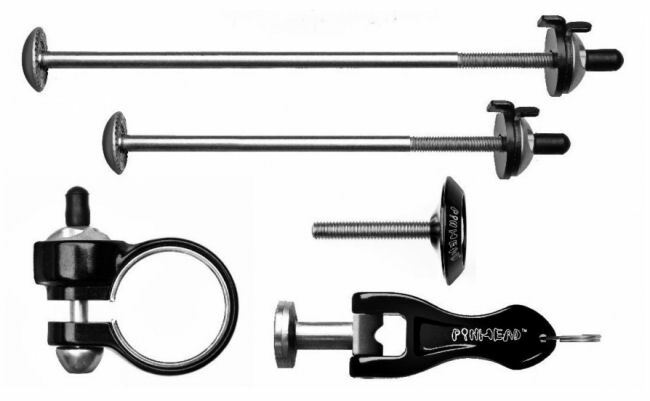 The set of parts shown below secures both wheels, the seatpost and a clamp-on handlebar stem. The special key shown at the lower right fits into recesses in the domed nuts. The keys and nuts are made in over 1000 different patterns. Devices are also made to secure nutted wheels and saddle clamps. There is no perfect defense against thieves. In a high-crime location, take extra steps to make your bicycle unattractive to thieves. You can easily disable a bicycle so it can't be ridden away. Taking the front wheel with you isn't much trouble if you are going to be at work all day. A folding bicycle offers special opportunities along these lines, as long as it can be locked securely. Remove easily-removable items -- lights, bicycle computer, bags. An easy-to-carry bag with a strap makes this more convenient. Some bicycle bags have this feature, or you could use a small backpack. Bert Hill describes how thieves work in teams of three: the first one checks out bicycles in a rack to determine which is most appealing and/or easy to steal, and what tools are needed. The second brings the tools and cuts the bicycle loose, but does not take it. The third one rides away on the bicycle. The one who inspects the bicycles may arouse suspicion, but walks away. The one who cuts the lock doesn't actually steal the bicycle, and can't be charged with that crime. The one who takes the bicycle doesn't appear to be doing anything unusual. If you see something, say something. You may be well-advised to lock your bicycle at home, especially if you must leave it in a public area such as an apartment-building basement. Even if this is inside a locked perimeter, dozens, even hundreds of people you don't know -- not only your neighbors but also maintenance crews and who knows who else, will see your bicycle there day after day. If you use GPS applications such as RidewithGps or Strava, mask your home location on GPS tracking applications. There are GPS devices which can report on the location of your bicycle if it is stolen, but they are expensive, and what would you do with the information?You could report the location to police, but you probably don't want to meet up with the thief yourself, unless with police assistance. A police sting operation can make good use of thsi technology. Also note, a bicycle with a single main tube poses a locking challenge. Some folding bicycles have separable seatstays, and locking the rear wheel will not secure the frame. You need to pay extra attention to be sure that the lock passes through a part that can't be separated. Or take advantage of the bike's folding and take it in with you. Ask your employer to install secure, sheltered bicycle parking at your workplace: a bicycle is as easily lost through by sitting out in the weather every day, as by theft. Kryptonite offers insurance in connection with its locks, at a reasonable price (see link below). Homeowner's and renter's insurance usually covers bicycles, but it won't pay for the inconvenience of being without a bicycle, or recoup the entire loss. The more expensive bicycles these days are sold on flash and spec hype. Light weight in a bicycle counts for much less than you might think because, after all, you are by far heavier than the bicycle. The modest increase in performance between a $400 bicycle and a $10,000 carbon-fiber wonder is important to racers -- but for daily transportation, choose a reasonable balance between expense and performance. Also, having more than one bicycle ready to ride is convenient if you discover that the one you rode yesterday has a flat tire, or if one is stolen. Keep a file of receipts, serial numbers and photos of your bicycles, to make it easier to file a claim if your bicycle is stolen, or to verify ownership if it is recovered. John's Raleigh Twenty shown below would be very low on the priority list for a thief. John Allen's Raleigh Twenty, brush-painted with drippy marine enamel. old Kryptonite lock, which secured the front wheel and the frame. hard to remove, with its internal-gear hub's nutted axle.